Aluminium frame, rigid fork and Shimano Nexus 7 speed hub gearing provides enough gears for everyday city riding and gives low maintenance cycling! This is something the Europeans do best - a comfortable city bike that's fully equipped with dynamo-hub lights, mudguards, chain guard and a rack. Shimano Nexus 7 speed hub and drivetrain allows for lower maintenance riding along with the ratio of gearing for everyday city riding. 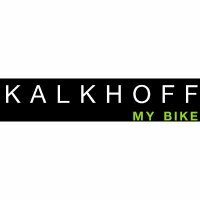 Smooth stylish design, you can tell why Kalkhoff are one of Germany's most highly regarded bicycle companies. Fitted with full mudguards, pannier rack, chainguard and kickstand. The front dynamo hub powers the high quality front and rear LED lights, so no light batteries to replace or recharge. The rear light has a stand light feature so it stays on when you stop at the traffic lights.